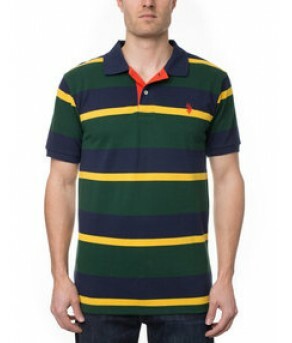 Our polo shirt is stylish yet simple featuring an allover stripe design with alternating widths and multiple colors. The contrasting front placket provides a splash of color, while the cuffs and collar are worked seamlessly into the stripe pattern. Wear it with jeans or with a pair of our slim fit corduroys for a streamlined, casual look. Short sleeves with contrast ribbed knit cuffs.